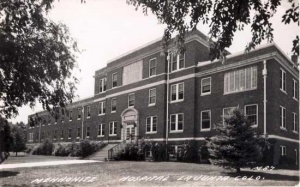 The Mennonite Hospital and Sanitarium, La Junta, Colorado, was a general hospital with a separate building for the treatment of tuberculosis (until 1955), operated by the Mennonite Board of Missions and Charities (Mennonite Church), Elkhart, Indiana. The purpose of the hospital was to provide medical, surgical, and nursing treatment for the sick and to provide for nursing education; the sanitarium was limited to patients with tuberculosis. The ultimate purpose was to carry a witness for Christ by ministering to both body and soul. Since tuberculosis patients were generally sent to an arid climate for treatment in those early days, many found their way to the west, and Mennonites from eastern sections of the Mennonite Church (MC), principally Virginia and Ohio, settling in Colorado found themselves confronted with the problem of caring for these sick people. At first some of them were taken care of in homes, but the need of an institution for their care was evident. Individuals such as D. S. Brunk, D. S. Weaver, and J. F. Brunk of the La Junta-Holbrook settlement then conceived the idea of organizing a sanitarium. Steps were immediately taken to organize a stock company for this purpose, and some certificates of stock were sold. The proposed plan was then presented to the Kansas-Nebraska Mennonite Conference meeting in Hubbard, OR, in 1905, which passed a resolution approving the project. However, the association idea was soon dropped, and the project was taken over by the Mission Board. A fund of $10,000 from the Mrs. Snavely Estate in Ohio was used for the proposed sanitarium. It was built on a hill overlooking the Arkansas Valley, about 5 miles (8 km) west of La Junta, and dedicated 28 October 1908 with accommodations for 38 patients. Very early in the development it was felt that the service should be adapted also to take care of general medical and surgical cases, and an appeal was made to the Mission Board to build a new hospital. The Board then leased a building located in the city and owned by the La Junta City Hospital Association, a 25-bed institution built with very limited resources. This equipment was turned over without cost to the Board, and on 1 January 1920 four nurses from the Sanitarium, Lydia Heatwole, Ada Burkhart (Ziegler), Ruth Erb (Ebersole), and Gladys Grove, began to operate the institution for the care of general medical, surgical, and obstetrical cases. At the General Conference session of 1921 final approval was given to the Mission Board to proceed in building a hospital. 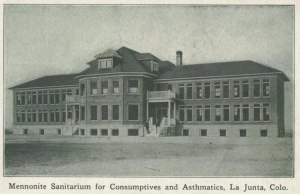 The original sanitarium was then sold and the sale price applied to the new building, which was built in La Junta in 1927 and dedicated on Easter Day of 1928. In 1946 a new wing was built to this hospital. In 1949 a new nurses' home was built for students in the La Junta Mennonite School of Nursing, which was established in 1915. The general hospital was a 108-bed institution, with 18 bassinets. From 1944-1954 the average number of patients admitted annually was 2,994; the average number of babies born annually was 724. The tuberculosis wing of this new institution had been operated as a tuberculosis sanitarium since it was built in 1928, but the reduction of the incidence of tuberculosis led to such a reduction of patient census that the state, which had been paying for all patients, directed the closing of the sanitarium on 1 March 1955. This marked the end of a 46-year period of experience in ministering to those afflicted with this disease. Many were helped physically, some were helped spiritually, and many nurses were trained to care for the sick. From the beginning, Christian services were held in which patients were invited to participate. In later years, a chaplaincy program was organized and executed in the institution. From the La Junta nursing school movement developed the present Goshen College Collegiate School of Nursing. Arkansas Valley Regional Medical Centre. "Arkansas Valley Regional Medical Center History." Web. 4 September 2006. http://www.avrmc.org/AV.nsf/View/History. Erb, Allan H. and Sam Steiner. "Mennonite Hospital and Sanitarium (La Junta, Colorado, USA)." Global Anabaptist Mennonite Encyclopedia Online. 2006. Web. 26 Apr 2019. http://gameo.org/index.php?title=Mennonite_Hospital_and_Sanitarium_(La_Junta,_Colorado,_USA)&oldid=113515. Erb, Allan H. and Sam Steiner. (2006). Mennonite Hospital and Sanitarium (La Junta, Colorado, USA). Global Anabaptist Mennonite Encyclopedia Online. Retrieved 26 April 2019, from http://gameo.org/index.php?title=Mennonite_Hospital_and_Sanitarium_(La_Junta,_Colorado,_USA)&oldid=113515. Adapted by permission of Herald Press, Harrisonburg, Virginia, from Mennonite Encyclopedia, Vol. 3, p. 629; vol. 4, p. 1146. All rights reserved.